The Winter Session 2016 of the Indian Parliament was a disastrous one, causing disappointment to all the voters who had elected their representatives. This winter session (2016), with repeated disruptions on the issue of demonetisation of currency, was the least productive session for both Houses (Lok Sabha and Rajya Sabha) in the last 15 years. In spite of the President of India conveying his anguish, the opposition leaders did not allow the Parliament to function on the pretext of one reason or the other. 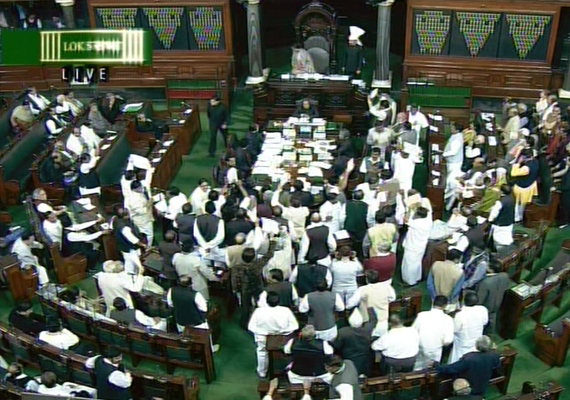 Both the ruling and the opposition benches blamed each other for this ruckus. The Lok Sabha worked for 15% of the scheduled time and the Rajya Sabha for 18%. While the Lok Sabha lost 107 hours of its scheduled time to disruptions, the Rajya Sabha lost 101 hours. Both the Houses had their least productive Question Hour session in the 16th Lok Sabha. Only two of the 330 listed questions in Rajya Sabha could be answered orally. This has been one of the least productive Question Hour sessions for the Rajya Sabha in the last three Parliaments. In the Lok Sabha, only 11% of the questions could be answered orally. 90% of the planned legislative business could not be transacted; the Lok Sabha passed the Taxation Bill without discussion. At the beginning of the session, 19 Bills were listed for consideration and passage; none of these were passed. Out of the nine Bills listed for introduction, three were introduced. Only two Bills were passed during this session. The following Members of the Lok Sabha have scored maximum points from the beginning of the 16th Lok Sabha till the end of Winter Session 2016. (For the purpose of our analysis, we considered only initiated debates, and excluded associate debates). Shri Shrirang Appa Barne (Shiv Sena, Maharashtra) - Debates (76), Private Members Bills (8), Questions (672) – Total 756 – Attendance 92%. Smt Supriya Sule, Nationalist Congress Party, Maharashtra - Debates (49), Private Members Bills (8), Questions (680) – Total 737 – Attendance 95%. Shri Rajeev Shankarrao Satav, Indian National Congress, Maharashtra - Debates (66), Private Members Bills (10), Questions (627) – Total 703 – Attendance 83%. Interestingly, all the above three top performers are from Maharashtra. PreSense congratulates all the top performers.